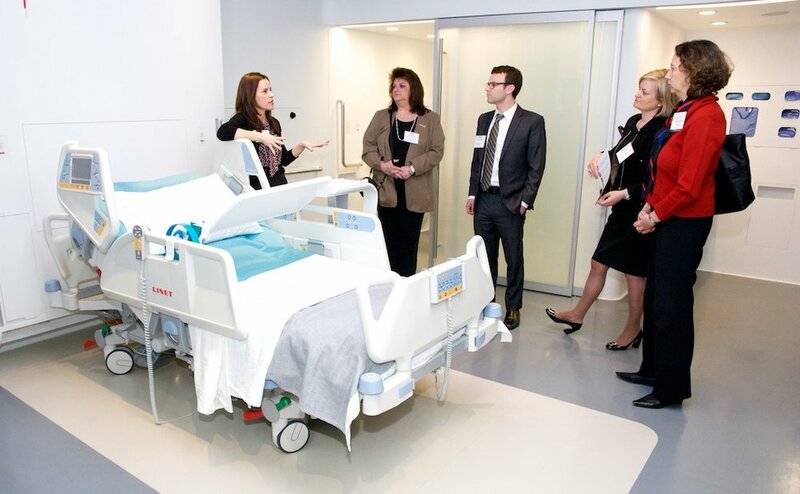 I moderated the NYC Health Business Leaders event on October 14th - Transforming the Patient Experience by Design - held at the DuPont Corian Design Studio, home to the next-generation Patient Room 2020. Design influences every part of the patient experience from thinking through how the physical structure impacts patient outcomes to planning the navigation through a hospital to creating a user interface that encourages patients to track behavior. With that in mind, we convened a panel of five experts - including two patients - to discuss the implications. It was a fascinating and wide-ranging discussion. Reimbursement and payment models drive behavior, and that is why we are now seeing more emphasis on the patient experience. Once providers and health systems feel financial pain, they will figure out ways to address the issues. Historically most systems were designed for not with patients. Movements like participatory patient design are still new and often make doctors uncomfortable. However, we clearly see that the provider-centric model is neither working for patients nor most providers. Changing the provider mindset is critical and has to occur before patients are engaged in process. Jakob Boije - President, Veryday US As a leader of global design consultancy Veryday, Jakob spends much of his time helping healthcare systems, pharma and device clients understand a patient's often-chaotic journey through his/her disease. Using people-centered design methods, which embrace a holistic, empathetic and collaborative approach, Jakob and his team have been able to create meaningful product and service experience breakthroughs, especially in the arena of Digital Health. Dr. Bon Ku - Associate Professor of Emergency Medicine and the Associate Dean for Co-Curricular Programs at Sidney Kimmel Medical College at Thomas Jefferson University in Philadelphia Bon is breaking new ground as director of College within a College—Design, the nation’s first design track at a medical school. Launched this year, the program aims to foster creative thinking in medical students to help them approach complex challenges in healthcare delivery, research, and education differently. The way doctors think about patients is formed in medical school. The point of Bon’s course is to embed more empathy and humanity into the process. Sandra Myerson, MBA, MS, BSN, RN - Senior Vice President and Chief Patient Experience Officer, Mount Sinai Health System Sandy joined Mount Sinai Health System earlier this year as its first executive dedicated to developing, leading, and fostering a patient-centered culture that provides compassionate, coordinated, and exceptional care. Not an easy remit! But she brings a wealth of knowledge to this role, both as a nurse and experienced hospital executive. In addition, she most recently served as Managing Consultant and Director of Clinical and Operational Consulting at Press Ganey Associates so understands what it takes to improve patient experiences. Robin Glazer – Director, The Creative Center at University Settlement and Patient Advocate Robin is a cancer survivor and artist and found a way to put those two together as founder of The Creative Center at University Settlement. The organization offers daily, free arts workshops for people living with cancer and other chronic illnesses. In 2009, the National Endowment for the Arts selected The Creative Center as a “Best Practice Site.” She’s also responsible for a Hospital Artists-In-Residence Program at 30 sites in NY/NJ and 60 more nationwide. She’s a passionate advocate for introducing arts into the patient experience. Alex Schmeltzer – Healthcare Analyst at Scoggin Capital and Patient Advocate By day, Alex works at a hedge fund but he was not on the panel to offer insights into whether or not Patient Experience was a good business investment. He’s a long-time patient who has been through the best and worst of experiences, in New York and in other states. He shared his views on what is lacking in many healthcare environments as well as those that get it right, such as Mayo Clinic.